Most visitors in Nepal buy pashminas, prayer flags or jewelry as souvenirs. ELI Abroad’s veterinary intern Madeline was much more original. 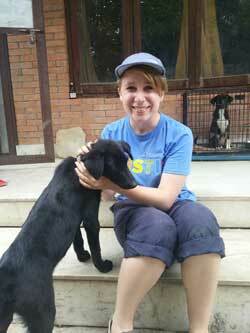 She came home with a four-legged friend found wandering through the traffic-clogged streets of Kathmandu. 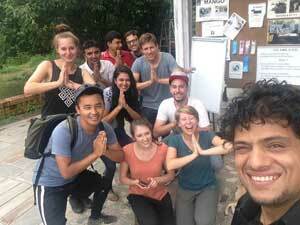 Bonding with Babu -- which means Little Brother in Nepali -- was the culmination of her 2-month long internship at a dog rescue in the Nepalese capital, an intense but rewarding undertaking Madeline recommends to all adventuresome dog lovers. Like other ELI volunteers and interns, Madeline lived in a group home in Thamel, the central tourist area of Kathmandu. After breakfast at the volunteer house, Madeline would be at the rescue by 9 a.m., and begin her day by cleaning cages, preparing a meal and feeding the animals, and washing up. Once the veterinarian and vet tech arrived, Madeline would join them at their rounds. At first she observed, then she was given simple tasks and finally, as her knowledge and comfort level grew, she was able to take part in everything from giving medication, to helping spay and neuter the animals and even assist during surgery. There were also dog bathing duties, applying medication to alleviate mange, wound treatment, vaccinations, looking for and eliminating tics and walking and interacting with the rescued animals. The work was constant, and very much needed. Madeline made sure to relax after work. Luckily, Kathmandu offers a welcome respite, with its restaurants, temples, cafes and vibrant, international traveler vibe. On weekends, Madeline would explore this stunning nation: Chitwan National Park, with its rhinos and elephants, was a huge highlight, as was paragliding in Pokhara. And then there was Babu. This medium-sized mutt, who appears to be part black lab, quickly became attached to her. Madeline’s parents were game to gain another family member, and Madeline discovered it’s “surprisingly easy” to get a dog into the U.S. The rescue center was helpful, providing documentation that Babu was vaccinated and healthy. There was just one stumbling block: how to get the dog on a plane. So she did what any quick-thinking Millennial would do. She started a GoFundMe fundraising drive to pay for Babu’s flight home. We’re happy to say, Babu arrived last weekend and is happily settling in with Madeline and her family in the American mid-west. So how about it, vet students and animal lovers? Follow in Madeline’s footsteps for the trip of a lifetime, a resume boost, and an unforgettable adventure. Adopting a pet is not a requirement! But expect to fall in love anyway.